This has been on the project list for a while since I made Phoenix hand soap. The scent wasn't overly popular in the hand soap but I thought it may have potential as shave soap. I think it works better as a shave soap and as I suspected works well mentholated. I thought the base had enough support to the high percentage of Coconut oil but is still foamier than what I like. There will be a V2 and I'll knock the Coconut down, add some Palm oil, Lanolin and Kaolin Clay. I'm happy with the scent but recognise it will probably be polarising, it's a soap you'll either like or not. The overall scent theme is smokey orange with some earthy wood undertones and some spice with the Aniseed and Ginger. I increased the menthol from my previous highest dose (Pb Grapefruit) but it's still very much medium volume. I think V2 will stand increased menthol. The hand soap featured some reddish pink swirling which is incorporated into this soap but is submerged. I'll put the swirl into the top layer of V2. 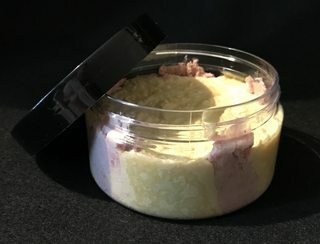 Ingredients: Stearic Acid, Coconut Oil, Castor Oil, Shea Butter, Emu Oil, Jojoba Oil, Glycerine, Tussah Silk, Beta Carotene, Red Mica, Menthol, KOH, NaOH, Filtered Water (RO), Essential Oils. Essential Oils: Sweet Orange, White Birch, Bergamot, Vetiver, Aniseed Myrtle, Ginger, Sandalwood (Australian). Phoenix lathered up easily and took reasonable amounts of water. 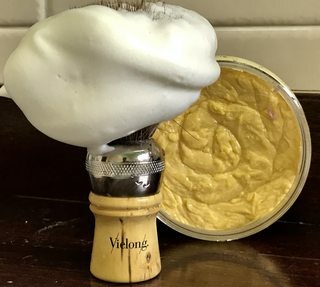 I was a bit dubious as to how the test shave would go given the lather was foamier than I what I like but couldn't really fault it. Test shave was with the Rocnel Elite which is probably on the mild side so I'll give it another run tomorrow with a straight razor. Post shave feel is very good which was probably to be expected with the Emu and Jojoba oil content. Menthol was very pleasant given we're pushing 37 degrees today. The scent notes sound like this one is going to be very enjoyable! Did the MkII of Phoenix this last week with the addition of tallow, beeswax and Kaolin. I need to work on the red mica addition, probably need to pipe it. It's not necessary but became the hallmark of Phoenix when I made the original Phoenix as a bar soap. Swirling doesn't lend itself to hot process. The menthol level was also raised a little so I'm guessing it's a Med on the cool - freezing range though I haven't chased high menthol content soaps so I don't really know. Overall I'm happy with the performance of this soap now so won't be looking to do a MkIII which is a welcome change from the recent trend.